This month, I read “The Productivity Project” by Chris Bailey. I received a complimentary copy from the publisher and have found it to be an excellent read. The productivity and time management genre has long been one of the most popular fields in business books. Bailey’s contribution is notable for his strong research, experimental approach and helpful exercises. In this review, I will discuss various aspects of the book that I found helpful and interesting. In the modern knowledge economy, there are three key personal factors that drive productivity. Bailey explains that time, attention and energy are key input factors to manage. At first glance, some people describe productivity as simply another label for time management. This book shows that time management per se matters yet it is not the most important factor. Self-management makes a huge impact to our attention and energy. The productive value of an hour varies considerably based on your current state. Tip: Use the strategy #1 from Neville Medhora’s Problem Solving Checklist as a resource if you find your abilities are not performing at their best. I first came across Chris Bailey’s outstanding blog – A Life of Productivity – a few months ago and I was immediately impressed. Bailey’s commitment to long form writing, analysis and experimenting with different approaches attracted my attention. His willingness to track results, numbers and share his findings reminds me of Tim Ferriss’s earlier work on productivity. The world needs more experimentation and validation for productivity ideas, so I hope Bailey continues his work. In some ways, the most valuable insight from the book is to apply an experimental perspective on your daily work. Throughout the book, Bailey provides a number of productivity challenges to the reader. There’s nothing new to exercises or workbook elements to a business book. Bailey’s innovation is to provide a rating (e.g. the fun rating for this challenge: 8/10) and estimated time for completion. Whether you adopt his specific experiments, I think there is great value in adopting an experimental approach to your work. You can use proven habits and routines 80% of the time and tinker with new methods the remaining 20% of the time. This is an outstanding principle use to increase productivity. In brief, you write a short list of three tasks that must be accomplished for the day. I have used this practice for months. My challenge with it is that I often feel a need to keep working beyond the three. Every day’s energy level and capacity is a bit different so it takes practice to get this right. Tip: I use the 5 Minute Journal to focus on the rule of three. I have previously written about the Weekly Review practice that I learned from David Allen. It is an excellent practice that is well worth learning. Bailey extends the review practice and takes it to a broader horizon. His review practice includes several key categories of life such as mind, relationships, health and career. I wonder if this higher level review might work better for me on a monthly or bi-weekly basis. In reviewing all of the tasks we complete in a week, many of them fall into the maintenance category. These tasks – such as cleaning and eating a good diet – do not directly contribute to our professional goals. Yet neglecting these activities quickly causes problems, unease and frustration. Bailey recommends putting all of these tasks – as much as possible – onto a single day of the week. I also second his suggestion to enjoy podcasts or audio books while going through these tasks. Hmm! I ought to write a blog post about podcasts. Stay tuned for more! Enjoying a few drinks, a cup of coffee or a late night out often means losing out on part of the next day’s productivity. Bailey points out that many of these activities mean directly impact sleep duration and quality. Fortunately, he doesn’t recommend a program of abstaining completely. The productive approach is to simply plan ahead. If you have a job interview or major presentation tomorrow, it makes sense to get an early night. Bailey makes great points that mindfulness, good sleep habits and diet have a major impact on our productivity. I think he is on the right track when he suggests that cutting an hour of sleep means two hours of lost productivity. If your work requires problem solving, analysis and other creative skills, taking care of yourself is an important aspect of promoting productivity. When you first get excited about productivity, it is easy to get carried away with the options. There are many productivity apps to experiment with and hacks to use. Bailey points out that one can do too much productivity activity and lose out on getting actual work done. I once heard a 10% rule in planning (i.e. use 10% of a project’s planned time for planning). A similar principle could be applied to productivity. If you have a 40 hour work week, limit productivity activities (e.g. planning, reviews, using task managers etc) to 4 hours per week or less. 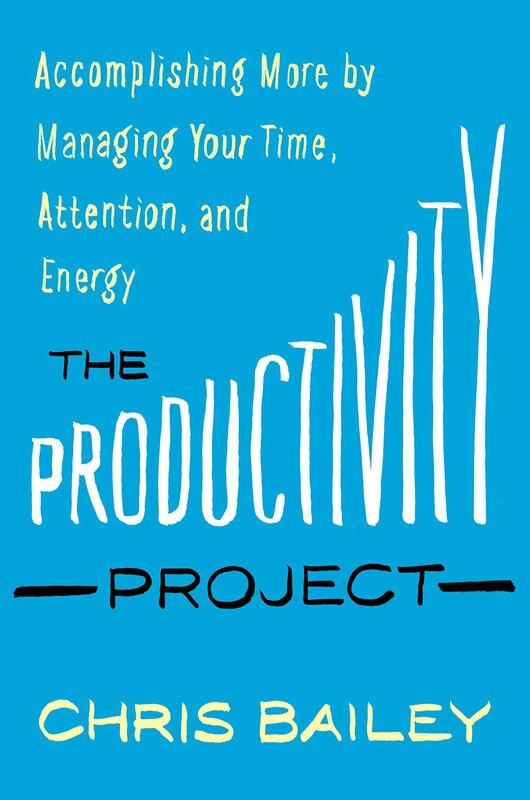 This book makes an excellent addition to your productivity library. Here are links to more information about the book and where you can buy it. It’s ironic that a book about productivity should turn out to be a colossal waste of our time. The author claims to have spent one YEAR trying out and refining the productivity tips and techniques, but I am sorry to report that he shouldn’t have bothered.